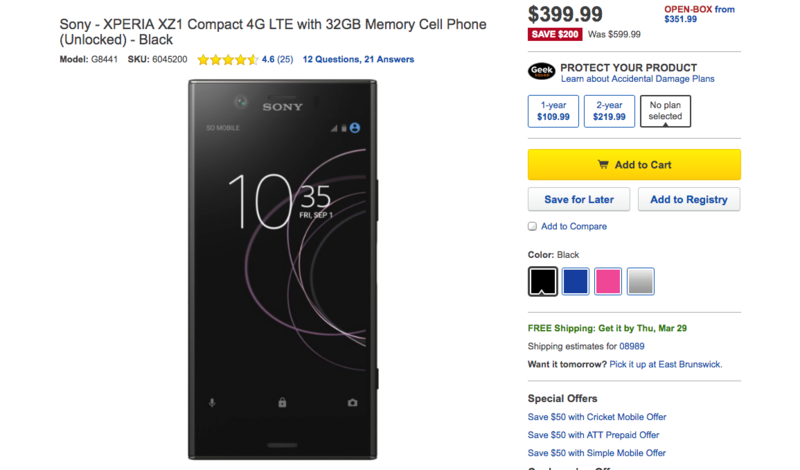 The last time we posted about a deal on the XZ1 Compact was back in November when it fell to the $450 mark. Its 720p resolution may seem low, but on a 4.6" panel, it's perfectly adequate. It's powered by the Snapdragon 835 and comes with 4GB of RAM, 32GB of storage with microSD expansion, a 19MP 'Motion Eye' camera with 960fps slow-motion, an 8MP front-facing camera, and a 2,700mAh battery. Also present are front-facing speakers, IP68 water resistance, and Android 8.0 Oreo. US GSM carrier compatibility is great; in fact, the XZ1 Compact actually supports T-Mobile's band 12 LTE and Wi-Fi calling. This $399.99 price point is the lowest we've ever seen. Best Buy has all four colors at that figure, but Amazon only has the black model for that much. If you're a fan of strangely-colored phones, you can actually pick a 'Twilight Pink' Compact up for just $379.99 from B&H. Other colors are hovering around $430 and $450 on B&H and Amazon, respectively. Hit the source links below to grab an XZ1 Compact of your very own.